I love this little set: Lawn Fawn/Ellen Hutson United We Flourish Love Ya’ Bunches. I have been wanting to monkey around with it again and I finally got around to it 🙂 . Eeeeek! So fun! And this paper is hoard worthy, but I am trying my best to use my favorites too vs. saving them. LOL. But the rainbow–want to keep forever–ha! ❤ I stamped everything and then used my Zig Clean Color markers to watercolor these cuties on Bristol paper. It turned out so fun, and my son is going to love finding it in his lunchbox Monday! For this, I used Essentials by Ellen All Inside ( and dies), EH’s Silver Linings, and Avery Elle’s Numbered Balloons and Party Animal stamp/die. Let me just say: I used more purple on this card than I’ve used all year? Haaaaaa! I colored this radish with Copic markers and fussy cut it out. I stamped the Wonky Backdrop with a Hero Arts ombre ink pad. Love how that turned out! 🙂 I stitched on some patterned paper and cardstock strips before I added the lot with foam adhesive. Such a fun card! For this card, I used Lawn Fawn’s Rooting for You stamp set. 😉 Always such fun to use these cutie veggies and their puntastic sentiments! This patterned paper is from Lawn Fawn, as well as the Lobster and Carrot color inks. Here are a couple other cards I made with these little guys…. HERE and HERE. ❤ These crack me up! I am playing along with the current Lawn Fawnatics Challenge color combo inspiration board! It’s pretty summertastic, if you ask me! 🙂 There is still time to enter too!! Join in! 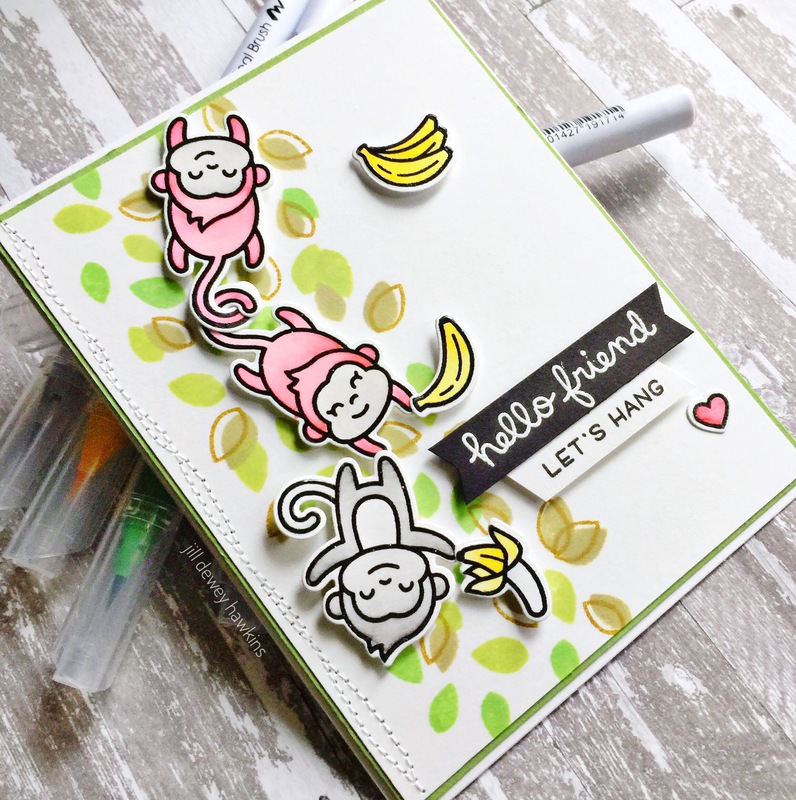 Popping in today with this card I made for the Essentials by Ellen Pin-Sights Challenge fun! When I saw this color combo inspiration, I was sold! I do love color! So glad I am squeaking this card in for the challenge! Whoooooohooo! Love these challenges at EH! I’m squeaking in my entry to this month’s Little Tangles challenge….phew! 🙂 I’m so glad I made it!